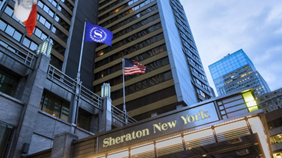 MDNA's 77th Annual Convention & Business Meetings will be from April 26 to April 29 at Sheraton New York Times Square Hotel. Book your room with the MDNA special group rate of $249 per night here. To register for MDNA's Convention quickly, go online here or you may also print the PDF form and fax/mail it in to the MDNA office. MDNA has secured a limited supply of Broadway tickets. Get the details here! For all links and more information on MDNA's Convention as it develops, please visit this page on our Calendar of Events. Sponsorship opportunities are available for the MDNA 77th Annual Convention. Whether you contribute $1,000 or $10,000 your company will be helping to make this year's convention special for all attendees. Contact Mark Robinson at 1-800-872-7807 or at mark@mdna.org or Convention Committee Member Jean Harris at jean@harrismachinetools.com.